Kim Hollis: Seth MacFarlane's Ted 2 debuted with $33.5 million this weekend, well down from the $54.4 million of the first film's opening weekend. Why was this film so much less successful? Jason Barney: I think the opening should have been much closer to the original, but for a couple of reasons, it came in far below it. I didn't think that the teaser was particularly interesting. Having the two main characters from the original on screen again could have worked, but the emphasis on the scene in the sperm bank just came across as "how raunchy can we make this?" I saw that ad for it and knew I was going to skip the film. Obviously a lot of other people did as well. Secondly, if a movie is not a big budget action film, it is not going to get the benefit of the doubt during the summer movie season. The Ted franchise is comedic, and if the first people who viewed it were not that impressed, word-of-mouth is not going to be helpful. If this was a good film, the buzz would be there. However, people are not going to pay to see a comedy that isn't that good - even if it is a sequel to a beloved film. 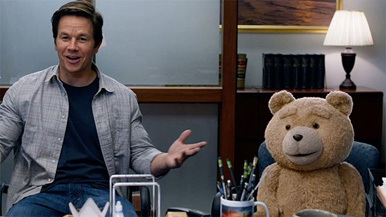 Edwin Davies: The main problem seems to be that the premise wasn't that appealing, at least compared to the first Ted. The first film had a very simple, high-concept premise, which was basically just "raunchy living teddy bear!" which was easily sellable in the trailers. The sequel's premise, by comparison, seemed really strained, as if they were really struggling to come up with a reason to bring the character back, and that desperation leaked out of the trailers, which struggled to find an angle to hang everything on. Three years might also have been too long of a gap between films, as we've seen a bunch of R-rated sequels fail after leaving a three year gap between installments, while 22 Jump Street exploded last year after waiting only two years.